When we think of Idaho, we think of towering trees, majestic snow capped mountains, rushing rivers, and of course, our cozy Triangle C Cabins. One of the best ways to experience our incredible area is to go on an excursion with Sawtooth Mountain Guides. Whether you’re looking to scale a mountain, blaze a trail, or learn more about the area, these knowledgeable guides will walk you through everything you need to know! Are you planning an Idaho adventure? Our complimentary Adventure Guide is here to help! We know that planning a trip can be challenging, so we created this free guide to save you from hours of research. In it, you’ll find more companies like Sawtooth Mountain Guides, outdoor activities, and more! Sawtooth Mountain Guides will lead you through anything you could possibly want to do in the Sawtooth Mountains. Any excursion you choose will be lead by a guide that is incredibly well-versed in the area. As the only accredited guide service in Idaho, you can be sure that you are in good hands. Each type of outing is broken down by level so you can be sure that you’re comfortable. They even have family-friendly offerings! Browse their excursion offerings, then reserve one for your time at Triangle C Cabins. Sawtooth Mountain Guides offer multiple climbing excursions. Choose from rock climbing to trekking peaks and summits. Whether you are a seasoned climber or just beginning, there’s a trip for you! Let your guide help you reach new heights with moderate climbs to challenging treks filled with granite boulders and ice. Whether you consider yourself a backcountry skiing expert or you have never put skis on in your life, Sawtooth Mountain Guides can take you on a snowy adventure of a lifetime! Speed through the gorgeous wilderness as the snow sparkles around you. These guides can teach you everything you need to know about exploring the powder-covered landscape on skis. People travel from all over the country to experience Sawtooth Mountains hiking. Let Sawtooth Mountain Guides plan your perfect trip. With over 350 miles of trail on these mountains, it can be challenging to know where to go. As experts, your guide will know where to see the best views of glittering lakes, rushing streams, and scenic overlooks! Choose a day hiking excursion or opt for a challenging multi-day trip. 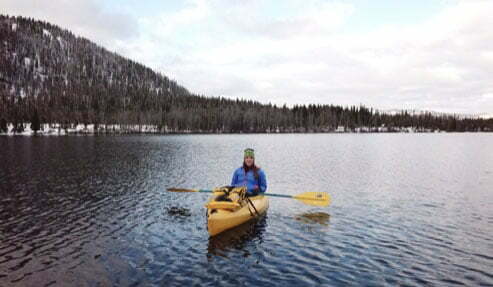 After your trip with Sawtooth Mountain Guides, come back and relax at Triangle C Cabins. 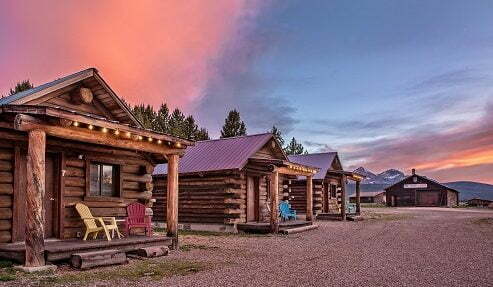 Our expansive property will be your home base for all your Idaho adventures! Come back to relax in front of our campfire pit as you roast some marshmallows or challenge a neighboring cabin to a game of volleyball at our net. Begin your planning by picking out a cozy cabin, then start choosing your excursions. Browse through our Adventure Bundles to add to your stay!